Jonathan Waxman of New York's Barbuto wouldn't leave a burning building without his leather satchel filled with knives—a gift from his friend, chef Michael Symon. 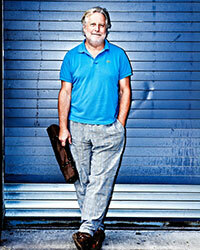 To see them, click through the slideshow, Treasured: Jonathan Waxman's Knives. Here, Waxman offers his three best tips for caring for beautiful, high-quality knives. 1. Buy the most expensive knife you can. They are always better. And go to a proper knife store like Korin and buy the tools to take care of it—like my leather bag. Leather won't dull your knives. Wood is better than plastic but leather is best. 2. Protect the tips. My wife uses my knives all the time and I come home and they have nicks and divots in them and I ask what happened?! Japanese knives are brittle so don't sharpen them often. 3. Learn how to sharpen on a cheap knife. Then do it right on an expensive one. All my guys grind their knives on stones all day long and that's just bad for the knife.